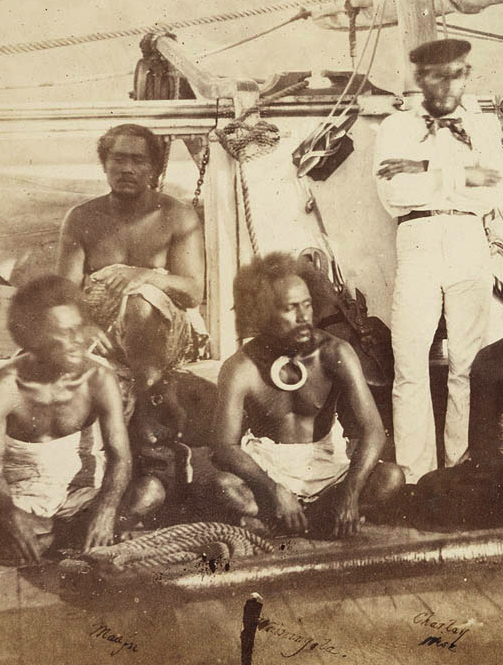 “Between 1809 and 1813 (age 21 – 25) Peter Dillon served, first as seaman and later as officer, on vessels trading mainly from Sydney to Fiji, New Zealand, and the Society Islands. This work involved lengthy periods ashore. In particular, he lived on the island of Borabora in 1810-12 assembling cargoes of salt pork for Thomas Reibey and others. This experience enabled him to obtain a good knowledge of several Pacific languages and cultures and to establish sympathetic relations with the indigenous peoples”. George Bayly, Sea-Life Sixty Years Ago (Lond, 1885); J. W. Davidson, ‘Peter Dillon and the South Seas’, History Today, vol 6, no 5, May 1956, pp 307-17. Author: J. W. Davidson Print Publication Details: J. W. Davidson, ‘Dillon, Peter (1788 – 1847)’, Australian Dictionary of Biography, Volume 1, Melbourne University Press, 1966, pp 306-308. In 1813 the East India Company’s ship Hunter, voyaging from Calcutta to Sydney, called at the Fiji Islands. Beach combers in paradise: They discovered that several Europeans were living on one of the group. Some had been shipwrecked; some had deserted from vessels; but they had become accustomed to the life and preferred it. Paid to collect sandal wood and beche-de-mer: The Hunter employed a party of them to collect sandal wood and beche-de-mer, one of her junior officers, Peter Dillon, being in charge. A quarrel with natives occurred, and all the Europeans were murdered, except Dillon, a Prussian named Martin Bushart, and a seaman, William Wilson. Larperouse SCOTT, Ernest, 1868-1939 Publisher Sydney : Angus & Robertson, 1912 ; Printer W.C. Penfold.